Today, I'm reviewing the ULT31434 13-piece ZipCord Laptop Connector Kit. The kit includes more than what you need in one simple package: RJ45, RJ11, USB and Firewire cables plus adapters to fit many connections. Each cable features a retractable cord that helps eliminate tangles and unsightly bulky mess. Everything comes together in a foam-lined pleather (plastic leather aka immitation leather aka pleather) carrying case with the word "Ultra" embossed across the top. The ZipCords are probably made in the same factory as Cables Unlimited's ZipLinq cables. This was determined from the three patents listed in the lower left hand corner of the back of the ZipCord packaging. The patents are held by Cables Unlimited, parent company of ZipLinq and I'm quite sure the letters "Z" & "L" in the patent number stands for "Zip" and "Linq." The primary difference between this kit that Ultra offers and anything that Cables Unlimited has is that Ultra has put 13 pieces into one kit for under $50. This cable unzips to 50". This can be used to connect your laptop's modem to a telephone jack. I found that this cable is a little on the short side. If you're in a hotel and plugging your laptop into the data port on the side of the phone, the length is fine. But if you're trying to plug your modem, which we'll say is up on a desk, into a wall plate which is typically only two feet from the floor, it's almost too short. Personally, I was looking forward to using this item because I currently work for a telephone vendor and often times we have phone cords wrapped around the telephone desksets that were carry around with us to test and program phone systems. I figured that an RJ-11 ZipCord would be much neater and handier than a 6 foot cable wound up around a phone. Unfortunately, only the center pair of wires are terminated to the ends of the cable, so the ZipCord could be used with digital phone systems, but not key systems that require two pair: One pair for voice and one pair for data. To Ultra's credit, they never advertised this device to be RJ14 compatible. For me to expect the RJ11 ends to have four wires terminated to them would be me having high expectations. But when the actual cable is a four wire cable and the RJ11 ends have four contacts on them, I wouldn't have thought that terminating all four wires to the end would be a big deal. Like the RJ-11 cable, this cable also unzips to 50". This can be used to connect your laptop to a network. Again, if your network jack is up on the desk, as it is in 90% of the hotels I've been to, then there's no problem with the cable's length. If the data jack is on the wall, there may be issues. On-site, this cord proved handy for making temporary patches on a patch panel when no other unused patch cables were available. Thank you. On a side note, this cable does not work in place of an RJ11, RJ12 or RJ14 because only the Tx and Rx pairs are terminated. This cable unzips to 60.5". Use this in any device with a 1/8" headset and phono jack. The cable is plenty long enough, and the microphone is in just the right position to pick up my voice, without being in the way. It is obvious to me that these headphones were engineered for voice use and not to listen to music as nothing lower than 300 Hz could be heard, making music sound very tinny. The ear-buds are more comfortable than your typical $10 ear-buds, but after prolonged use, the insides of my ears started to hurt. This one unzips to 31.5". Use this cable to connect a number of USB devices, such as digital cameras, etc. to your typical PC USB port (USB "A" Female.) This cable is required to use the below mouse. The package says this is a two-button mouse. I guess Ultra didn't realize that the scroll wheel pushes down and clicks a third button. After using the aforementioned Male "A" to Mini 5 cable, I could plug the mouse right into my USB port and begin using it. The mouse is small without being too small, can be used either left or right handed and has a nice rubberized feel to it. It aeems to work very well and is easy to clean (the whole mouse comes apart with one screw.) As with most any optical mouse, it doesn't work well on some surfaces where light is easily reflected, such as a glass coffee table. This cable and the below USB "A" Male to Female cable are the longest of the kit. Measuring in at 59" long, yes the cable is nearly 5 feet long! I couldn't find a reason to plug in a Firewire device 5 feet from my computer, but it's nice to know that if I wanted to, I could. The cable has a 6-pin connector on both sides. I was thinking that having a 6-pin on one side and a 4-pin on the other would make more sense because MOST Firewire devices use the mini 4-pin connector and MOST computers have a 6-pin Firewire connector, unless you're using a laptop. I found myself ALWAYS using at least one of the below adapters to adapt one of the 6-pins down to a 4-pin and often using both adapters if I had to plug something into my laptop. Not a big deal, but sort of a clunky end result. There are two of these adapters included in the kit. These were necessary for plugging my Firewire devices into my laptop using the above 59" cable as my laptop and Firewire devices only have a 4-pin Firewire port. This is the other long cable in the kit. This makes sense as it's most functional as a USB extension cable being that it has one male end and one female end. You can add another 5 feet of distance between your PC and your mouse. You can plug your memory stick into your computer from 5 feet away. I'm sure you can find a use for this cable. This adapter can be used to convert a Female "A" connector to a Male "B" connector which is good because it makes the above 59" USB "A" Male to Female Cable into a USB "A" to "B" cable, which is how about 90% of USB devices hook up to a PC. This adapter adapts the "A" Male to Female cable into an "A" to Mini 4-pin cable. This is good for some devices, like certain digital cameras and MP3 players, that take the really small USB Mini 4-pin connector. Use this adapter on the "A" Male to Female cable and now you have TWO "A" Male to mini 5-pin cables, only one is 31.5" and the other is 5 feet! Someone, not me, could use this to convert a male to female cable into a male to male cable or plug to male to female cables together to make one long male to male cable. No, really. I somewhat question the durability of the ZipCords. Currently, my headset ZipCord doesn't stay unzipped. The concept of retractable cords is not a new one. I actually have had an optical USB mouse with a retractable cable for nearly two years. The construction of the retractable cable is clearly superior and I've never had a problem zipping it or unzipping it. The damn headset has zipped itself up and whacked me in the face about three times in the last 30 minutes, and I've only used the thing for about 2 hours total! My other 12 ZipCords seem to be doing fine in this respect, but I've only used any one of them for an average of a couple hours. On one hand, these aren't the kind of cables you're going to find yourself using for long periods at a time, but on the other hand you want them to work when you need them. Perhaps the broken ratchet in my headset is an isolated incident. I'm sure it's something Ultra would be happy to warranty. But another thing I've noticed with ALL of the cables is that they are difficult to zip back up. You're supposed to go just a tad bit past a click and the cable should zip itself back up, but this wasn't always the case. Often, the cable would just lock in the position and I'd have to go to the next click to try to retract the cable again. The kit retails for $49.95 and sells for as much at TigerDirect. I found the kit for $36 at ZipZoomFly, which seemed to be the cheapest price out there. $36 is a decent price for what you get here. 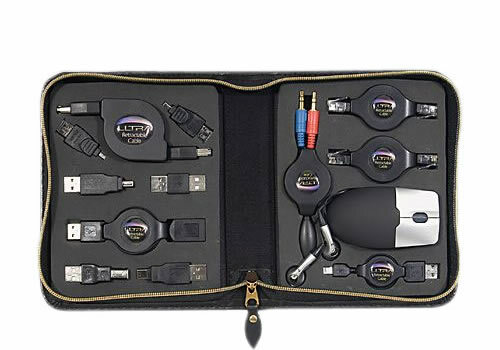 If you were a mobile PC technician, the kit could be a steal at $36 considering you may actually use all of the connectors at different customer's sites. But it is very unlikely most of us would ever need ALL of these connectors in one kit. Look at the way Ron Popeil sells the Six Star cutlery set. You buy the Showtime knife for $40 and you get 15 extra knives, a pair of scissors and a knife block for free. Ok.. You're really not getting 15 knives for free. The knives really are that cheap, but they're good enough knives and easy to justify paying $40 for perhaps one or two. It's perceived value. This kit has no hook. Maybe if it was the travel mouse and a mini USB hub and everything else could be perceived as "free" it would seem like a good deal. I suppose If you're willing to give out $15 for a portable optical mouse (the going rate) and $10 for the Firewire or USB cables and another $10 to $20 for the adapters that you may use and you get a pleather case to carry it around in, it may seem like a good deal. But from now until Christmas, you can get a lot of the seperate connectors for free, after rebate, from TigerDirect! So I suggest looking at my description of each connector, determine if you'll ever use that connector, and then see if you can get it for free from Tiger, add the items you may actually have to pay for (like the mouse or Firewire cable) and see if it's cheaper than $36! Maybe give yourself a $5 ceiling for the pleather case. It is a pretty nice case, after all. Everything comes packaged in this nice little case. Now, the next paragraph was tough. When I'm given something to review, it's my duty to find as much fault in that product as possible. I know a lot of guys at a lot of other review sites say, "Well, I got this item for free and it does this and it does that so I'm giving it Editor's Choice" but I don't work that way. I always grade on a hell of a curve. 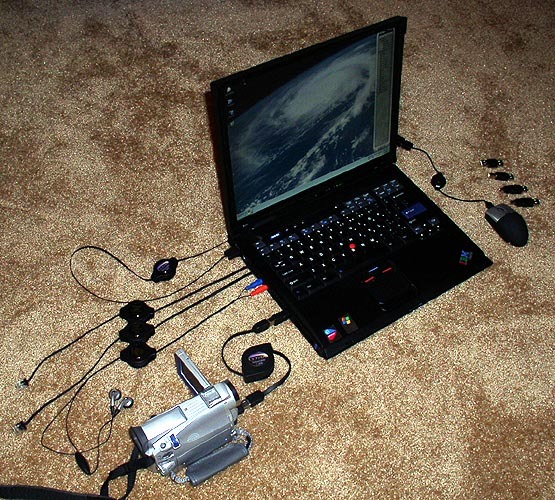 Here I have the entore collection of ZipCords, minus four unused adapters (shown far right) plugged into my laptop. I'm taking half of a point away from a 10 rating for every time I was whacked in the face by the headset ZipCord zipping itself up. I'm going to take a whole point away because they cables wouldn't always zip up properly. There shouldn't be a "trick" to zipping the cables back up. I'm taking another half of a point away for not making the headset so it would sound good with music, despite the supposed target audience for this kit. I realize it's adequate for VoIP or voice recognition, but it doesn't take much to add some more dynamic range to a pair of ear-buds. I'm taking a half of a point away for only terminating 2 out of 4 ends of the RJ11 cable too, because I'm the one writing this review and I'm still pissed off about being bopped in the nose by a little plastic disc with the words "Ultra Retractable Cable" on it. I'm going to take another half of a point away for making the Firewire cable 6-pin Male to Male and instead of 6-pin to 4-pin and then including a 4-pin to 6-pin adapter instead of a 6-pin to 4-pin adapter. I'm going to take a point away for the price of the unit. I like look at this package and think $29.95. I will give a point back for the nice pleather case, though. My rating is an 7 out of 10, which isn't that bad at all. The kit is very useful. I will be using several elements of this kit personally from here on in, but would I pay $36 to $50 for it? Probably not. Will I continue to use the headset? No. If another ZipCord messes up and starts zipping itself back up, will I attempt to get a warranty replacement? Yes. Almost any connector you could possibly need in one kit. Cable retraction makes for very clean, portable cables. Nice case makes it easy to store everything in a small, organized area. Mouse works well and is ambidextrous. Good value considering how many pieces you get, assuming you would ever actually need ALL of these pieces. Question about quality. Ratchet gave up on headset after minimal use. Difficult to zip back up. Wouldn't alway zip up on demand. Only 2 of the 4 wires on the RJ11 are terminated. Headset only really good for voice quality audio. A little pricey considering most people wont ever need ALL of the pieces included in the kit.